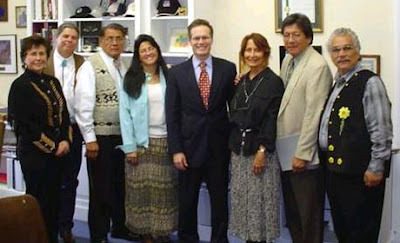 (Rosh HaShanah) at 10 A.M., a team of seven (7) Native American Indian leaders met at the White House with Mr. Rubin Barrales, Deputy Assistant to the President and Director of Intergovernmental Affairs. Mr. Barrales received our "PROCLAMATION OF FORGIVENESS"
(see below) in behalf of President George Walker Bush. We went as representatives of the Native community to address the America people's "Chief". It was a "heads of nations" meeting if you will, and we went according to Native protocol. We went to declare forgiveness on behalf of our people and declare forgiveness in Jesus' Name and to ask our Heavenly Father to roll back the reproach and defilement on the land so that we might see revival in our nation. The names of the ministers who went to the White House: BISHOP GLEN W. ANNISKETTE is a Tlingit Indian from Alaska. Glen currently lives in Tennessee. He has been ordained a bishop in the Church of God, Cleveland, TN and is an International Missionary Evangelist-at-Large. He has traveled to many nations financing evangelistic crusades touching countless thousands with the power of the Gospel. REV. M. GEORGE KALLAPPA, SR. (Makah Tribe, Neah Bay, WA). After Rev. Kallapa received his Bachelor of Theology degree from Seattle Bible Training School he immediately went into full-time ministry traveling to 60 tribal groups. He currently serves as Superintendent of the American Indian Fellowship of the Northwest Ministry Network of the Assemblies of God. CHIEF G. ANNE RICHARDSON (Rappahannock Tribe, Powhatan Nations of Virginia) is an ordained minister and ministers to American Indian tribes in the United States through Restoring Nations International. She is a fourth generation chief in her family and is the first woman chief to be elected to this position since 1705. Chief Richardson has a strong annointing and is called on to speak in many venues including governments,universities, and museums. FLO E. ELLERS (Tlingit from Alaska) is ordained with International Fellowship of Ministries--a John G. Lake ministerial organization. Rev. Ellers received her doctorate from Shalom Bible School, West Des Moines, IA in 1999. She has been traveling to the nations and working in full-time ministry since 1982. Her ministry is Global Glory Ministries, Inc. Her current passion is to raise up and equip God's end-time revivalists. Dr. Ellers was asked to be the Native American representative during the "2nd Washington for Jesus" rally in 1996, where 500,000 Christians gathered at the Washington Mall in WA. D.C., to pray for this nation. She was given, along with the other speakers, 10 minutes to address the nation. As she prayed, the Holy Spirit inspired her with what later became known as the "Proclamation of Forgiveness" (see below). Recently, Flo sensed the prompting of the Lord to present this document to President Bush so she worked with State Senator Greenleaf of Pennsylvania and he helped facilitate a presidential appointment with Mr. Rubin Barrales to present the "gift of forgiveness" to the Nation's Chief. She, along with her team, believe that the President of the United States has accepted this forgiveness, Heaven has recorded this prophetic act, and as a result revival will break forth in America.